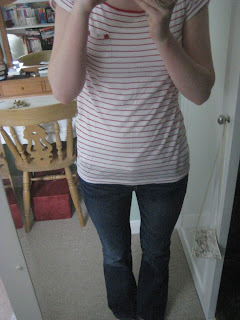 Everything But The Kitchen Sink: I love you jeans! I cut my face out as I had no make-up on and my hair was wet, not exactly blog-worthy! Today was my first morning off in ages but I had a ton of stuff to do so no lie-in for me. Unfortunately it was my dad's aunties funeral today, which is sad coz she was quite close to me but meeting my extended family made me realise that she had had a happy 90 years, travelling the world and doing some amazing things, which hopefully I'm going to find out more about the family tree with help from my mum! Sorry for the change in background, I could photo my jeans better in another mirror! These jeans really don't get enough love from me. I'm a skinny jean girl through and through and purchased this pair ages ago (I remember dragging my sister through bluewater shopping center trying to find the perfect pair!) after feeling a desire to have a flared pair and break away from skinnies. Looking from these pictures they make my legs look a bit short but even so I always feel great in them! 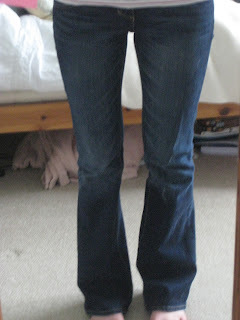 Has anyone got a favourite pair of jeans?